When I pack bags for a trip, I always try and picture the kinds of activities I’ll be doing and the items I’ll be carrying with me. Sightseeing all day? I’ll probably want a crossbody bag with room for a water bottle, sunscreen, a snack, and my backup iPhone battery. If I’m working, I’m wearing my backpack or toting a large enough bag for my computer and tech accessories. I rarely bring a small purse but this Spring, I’ve found my favourite small bag, because I’ve discovered a billion four ways to wear it. I bring two straps and a wristlet which I can swap for different looks and functions. The black strap is adjustable, so I can make the strap shorter and wear it near my body, keeping my things accessible but out of my way. I can also spin it around and wear it on my back. That same strap can be adjusted around my hips to create a fanny pack. I promise it isn’t *that* dorky. The chain strap adds a little bit of fanciness to an otherwise simple bag. 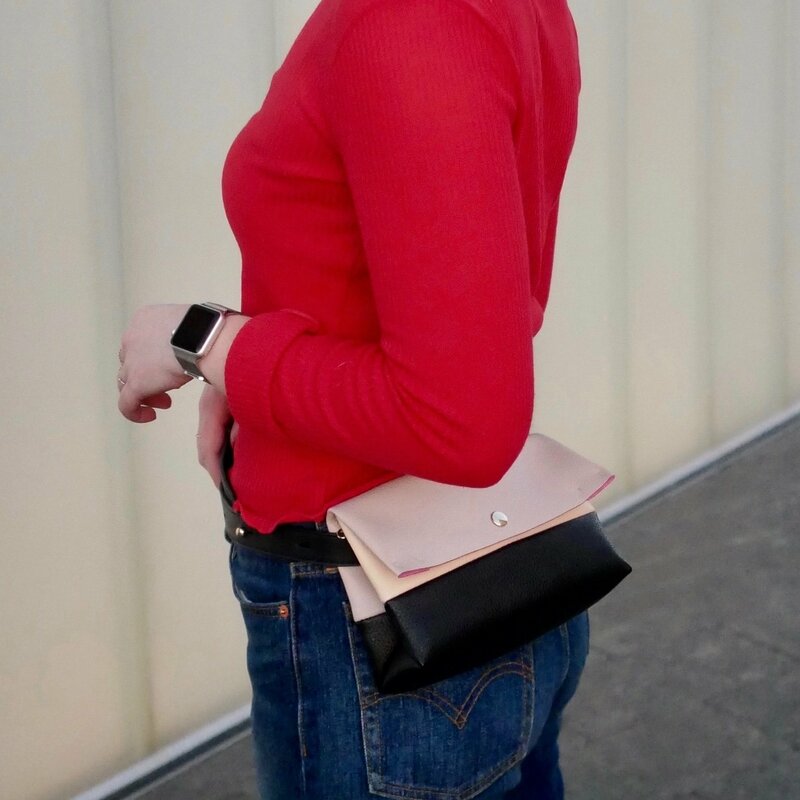 I’m a fan of clutches and adding a leather wristlet makes it a little easier to carry. Love the bag! Who makes it? Hi Christine! Thanks for commenting. This one was a random purse from TJ Maxx. It didn’t even have a tag! You could do the same thing with any small bag with removable straps. The wristlet keychain I bought at American Apparel. Great idea…and a way to look at changing up bags that I own already too!